This candy holder craft makes the perfect Valentine's gift. Who wouldn't love a little bug full of candy? 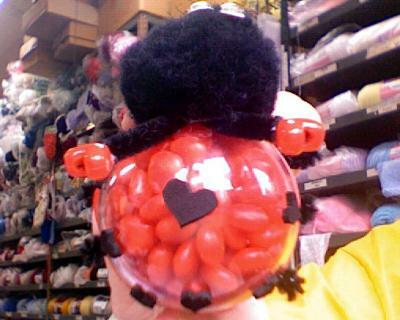 The larger photo shows the love bug candy holder from the top. The smaller photo on the top right shows the bottom of the candy holder. 1. Draw small hearts on the back of the foam sheet and cut out the hearts. Stick these hearts on back of clear part of container. About 8 or 10 should fit. 2. Find the center string of the pom pom and glue it to the container on one side of it. 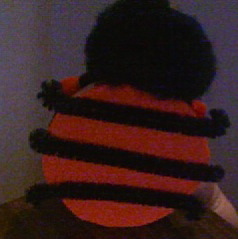 This will be its head. glue into pom pom close to the container. This are the antennae of the bug. 4. Take the remaining 3 pieces of stem, curl the ends and glue them to the bottom of the container. These are the legs of the bug. If you use the 1/2 of the ornament you will need to cut out a bottom from the foam and glue it to the container. The small photo on the top right is showing the bottom view of the love bug. Fill with candy and give to your valentine! Thank you Michelle! I just love it... a wonderful idea. I love that this craft incorporates re-using something that we normally may throw away. Thank you for sharing!